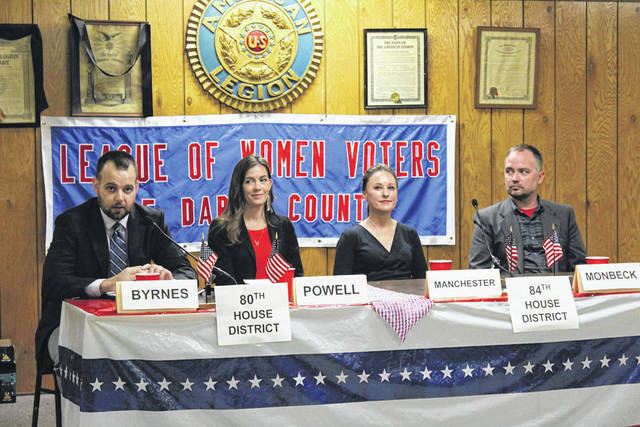 Candidates for Ohio’s 80th House District and 84th House District made their case Tuesday during the Darke County League of Women Voters Candidate Night. Pictured, from left, are D.J. Byrnes, Jena Powell, Susan Manchester and Joseph Monbeck. GREENVILLE — Four Ohio House hopefuls took the stage Tuesday to answer questions during the Darke County League of Women Voters Candidates Night at the Greenville American Legion. Vying for the 84th District seat, which incorporates Mercer County and parts of Darke, Auglaize and Shelby counties, are Susan Manchester (R) and Joseph Monbeck (D). Seeking the 80th House District seat, which includes Miami County and part of Darke County, are D.J. Byrnes (D) and Jena Powell (R). Candidates were given time to introduce themselves before being asked a series of questions submitted by audience members. The candidates were asked how President Donald Trump’s trade tariffs with China will affect Ohio farmers and what they would do to help farmers. Byrnes called it “a stab in the back” to the farmers who put him in office. “His response to the trade war he essentially started was to hand out a bunch of money, which again, in typical fashion, helped the big corporate farms rather than small family farms,” he said. Asked if Ohio should pass a “Right to Work” law, by which workers would not be forced to join a union, Manchester supported the idea, Monbeck and Byrnes both came out against it, while Powell said it was a “good question” and had to be looked at from a state government perspective. In rebuttal, Byrnes called out Powell for not giving a straight answer, saying she has accepted money from unions. Powell did not respond. Asked their thoughts on Medicaid expansion and recovering local money from the state for Medicaid, Monbeck said he agreed with the expansion and that the money should be returned. Manchester said the number of people who qualified for Medicaid expansion has surpassed expectations. “We can’t continue on with Medicaid expansion; we have to reform it,” she said, proposing a “step-down” system by which people would not be faced with the choice of receiving assistance or employment. Regarding a submitted question on “assault weapons,” Manchester called herself “100 percent pro-Second Amendment” and called for more funding for school resource officers and improved mental health services in schools. Byrnes proposed a measure which would add an extra level of permits for those wishing to own one. Monbeck admitted to being a gun owner but called the National Rifle Association a lobby whose main goal is to sell “instruments of murder” and said he supported universal background checks on all gun sales. On the issue of medical marijuana, Powell called marijuana a “gateway drug” and does not support its use in Ohio. Monbeck said marijuana laws should be changed on the federal level, allowing states to perform more research. Manchester, while not discounting it entirely, said the state should “carefully examine” the issue moving forward and it should be highly regulated. Byrnes said he supported medical marijuana laws and added opioid use in Colorado went down after legalizing marijuana. On Social Security, the candidates were in agreement that it should be preserved, but Manchester pointed out not as many people are paying into it as are collecting from it. “Currently Social Security as it stands is not financially viable if things continue moving forward as they are,” she said. Byrnes called Social Security “one of the most beloved programs in all of America” and said we owe a debt to seniors. Byrnes said his top priority is the state returning funds to local municipalities. He added “solving the health care crisis” and a minimum wage increase, overtime protection and reliable, rural broadband internet. Monbeck pointed to restoring local funding and improving workforce development by investing in health care, education and infrastructure as his priorities. The forum was videotaped and may be viewed on Channel 5 WAVE on YouTube or at the many convenient times on TV. It lasts 1 hour and 20 minutes and will be broadcast without any editing starting Sundays, Oct. 28 and Nov. 4 at 6 a.m., 1 p.m., 4 p.m. and 10 p.m. as well as: Mondays, Oct. 29 and Nov. 4, 1 p.m.; Tuesday, Oct. 30 and Election Day, Nov. 6, 6 a.m. and 1 p.m.; Wednesday, Oct. 31, 1 and 4 p.m.; Thursday, Nov. 1, 6 a.m. and 1 p.m.; Friday, Nov. 2, 4 p.m.; Saturday, Nov. 3, 10 p.m. At YouTube, go to the Channel 5 Wave page. UPDATE: According to the Darke County League of Women Voters, Channel 5 WAVE’s recording of Tuesday’s Candidates Night did not record correctly. Thus, the forum with Ohio House candidates Susan Manchester and Joseph Monbeck of the 84th District and D.J. Byrnes and Jena Powell of the 80th District cannot be shown on local public access television or YouTube as previously planned. This entry was tagged Candidates Night, D.J. Byrnes, Darke County League of Women Voters, Darke County League of Women Voters Candidates Night, election, Elections, Greenville American Legion, Jena Powell, Joseph Monbeck, Susan Manchester. Bookmark the permalink.